Alex Reyes was considered to be a top-5 prospect coming into the 2017 season. Then his elbow gave out and he eventually needed Tommy John surgery. He’s nearing completion of his recovery and the Cardinals are considering when he’ll return and his role. Wanting to protect their top prospect as much as possible, the Cardinals have set a soft target of May 1 as a likely return date for Reyes. What hasn’t been so explicitly defined, though, is what role he’ll fill upon that return. Long term, the Cardinals have every intention of using Reyes to anchor their rotation. MLB Pipeline recently ranked Reyes as the seventh-best right-handed pitching prospect, and he likely would have been higher on that list had he not just missed a full season. But given the recovery process Reyes has undergone over these last 12 months, the Cardinals intend to be cautious in 2018. Their preference, as stated multiple times this offseason by president of baseball operations John Mozeliak, would be to have Reyes first come out of the bullpen. For fantasy owners, they could take a chance on having an elite arm as a starter or reliever. With so many possible unknown outcomes, the following is a breakdown of 2018 value. First off, his surgery date was February 16th last season. With the normal 14 to 15-month recovery time, the reported early May return is right on schedule. With the return time verified, the biggest key is his role. This situation reminds when owners were trying to determine Aroldis Chapman’s value before his rookie season. They were trying to balance a great reliever against a solid starter. I asked my Twitter followers how they thought the situation would be handled and here are their responses. With the @Cardinals Alex Reyes, how do you expect him to be utilized once returning from the DL? No role is running away with the voting. Let’s start with Reyes’s closer projections. Reyes could be an amazing closer. He’ll be able to ramp up his high 90’s fastball and mix in his plus changeup. Talent wise, he’d become one of the league’s top-10 relievers. The Cardinals bullpen is not full of lights out arms and could probably use some help. At best, Reyes becomes a closer for five months. Worst case, he just sets up the actual closer as the 7th inning guy. Now, if Luke Gregerson is effective and Brett Cecil is healthy, Reyes may not be needed to close but could throw a couple of innings bridging the gap from the starter to the other decent relievers. I’m not sure Mike Matheny is up for managing a pitcher without a set role but maybe he can change. And there is the starter option. As seen in the above poll, this is the most likely option as seen by the poll answer. If he’s going to start, he’s not going to get a full season of starts. To find out how he may be used, I went back over the past few seasons and looked for decent major league starters who returned from Tommy John surgery. Then I found out how much they threw the season coming back. 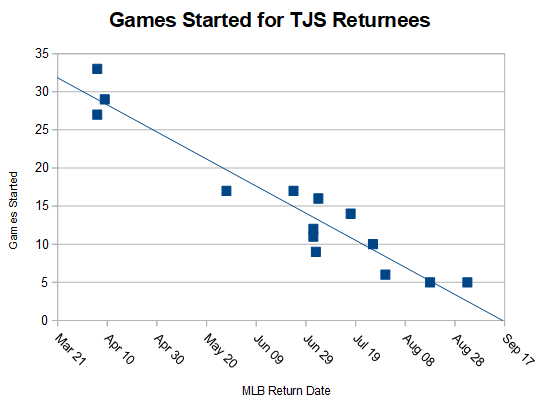 * Here are the innings and games started plotted by return date. Estimating off the best fit line, Reyes is likely to start around 25 games and throw 145 innings if getting to the majors May 1st. This scenario is the best option for owners. Having a starter showing up in early May to help a struggling staff could be huge. As for Reyes’ s talent, owners shouldn’t expect peak Reyes (that will be in 2019) but his talent drop off won’t be huge. 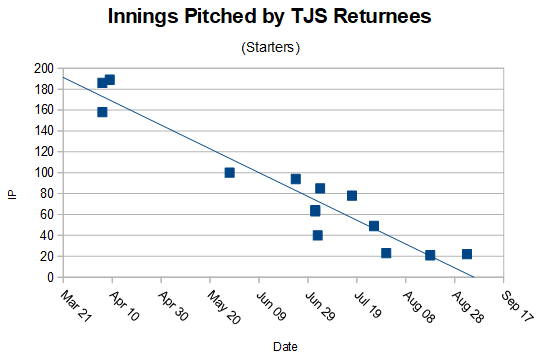 Historically, the pitcher experiences a 5% worsening of his stats when he comes back. Most of his 2017 projections pegged him near a 3.50 ERA. His 2018 projections near or over a 3.75 ERA are reasonable. 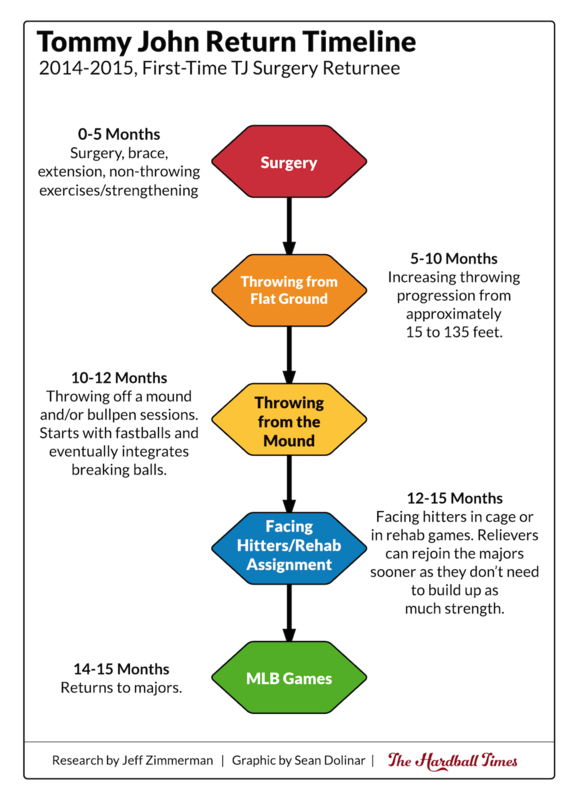 With the recent high success rates for pitchers returning from Tommy John surgery, owners should expect him to come back but still check up on him. Follow any spring training velocity reports and once the game data to see if his fastball is back up to speed. Trust but verify. Here’s how I see his entire situation working out. The Cardinals will go into the season with him stretching out to start. When it gets closer to May 1st, they will move him to where the team needs the most help. Both the bullpen and rotation are not deep so one or both could be the destination. Savvy owners should embrace this uncertainty. Without knowing his role, some owner may stay away. If possible, owners can hopefully stash him with a DL slot and then gauge how he will be used as spring training and the first month works out. He’s a must-own in all leagues with the chance he eventually starts. If not, owners in shallower leagues will know rather quickly his role and can move on. In deeper leagues, the worst case is an acceptable multi-inning fireman role. Currently, his cost is that of a multi-inning reliever with an NFBC ADP of 259. Similar pitchers going before him are Fernando Rodney (243rd), Shane Greene (243rd), Sean Manaea (253rd), and J.A. Happ (256th). Reyes’s price is nothing right now and is going in the last few rounds of 12-team drafts. Is his projected season any worse than Rich Hill (120 ADP) or Hector Neris (144 ADP)? I’m all in at Reyes’s current price based on five months of starting and knowing his role within a month. As long owners can stash him, they should and possibly enjoy huge profits. We hoped you liked reading Alex Reyes: Undervalued by Jeff Zimmerman! Power Up — Who Would Benefit From More Pulled Fly Balls? I wish Reyes would go right into the rotation, but I think the signing of Mikolas and the non-trade of Flaherty (probably next in line to start by virtue of *not* coming off TJS) mean Reyes has to be bullpen bound.